If you want to play poker online, it’s actually quite simple, and you can start playing in a matter of minutes. With that being said, there are a few things to watch out for to ensure your online poker experience is Safe and Secure and problem free. 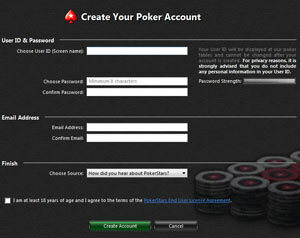 In this guide we are going to outline 5 easy steps to follow to get you started playing online poker. There are a few things you will need to do before you start playing online, but follow the steps closely and we will guide you safely through the whole process helping you to avoid the pitfalls along the way. The first step is to choose an Online Poker Room to play at. There are many to choose from, with some being more reputable and established than others. This is often the first hurdle a beginner struggles with because there is so much choice out there and they are all competing for your business so they throw attractive sign-up bonuses & offers at you left, right and center. You must choose carefully to ensure you are protected as a player and consider a number of factors. Trust & Security – Choose an established operator with a history and ensure they are licensed and regulated by an recognised authority. Game Type – choose a poker site that is best suited to the poker game you have chosen and has a good selection of games available for the stakes you want to play. Different sites are better for different poker games / stakes and some don’t even offer some lesser played games. Beginner Friendly – As a beginner player you want to be matched with players in a similar situation and skill level as yourself. Some sites contain more experienced players, and others have a lot more beginner players and these are the sites that you want to play at. Promotions – In a competitive market sites are competing for your business by offering you promotions and cash bonuses to play at their site. Although this isn’t the most important factor you want to ensure you are getting a good deal for signing up at their site and sign up for a site that will continue to offer you rewards even after you have signed up. Customer Support – You never know when you will have a question, or need some help so you will want to choose a site who has a proven track record of good customer support, so that they are there for you if you need them. That’s a lot to take in, and to be checking, and as a beginner with no knowledge of the industry if can be very hard to do. This has lead to some mistakes being made by beginners in their choice resulting in some less than favourable stories of beginners being lead astray by less trusted operators. That’s why we have developed our Poker Finder Tool which will allow you to input just a few simple criteria and our Poker Finder will search it’s database checking all the factors above, and come up with a recommendation on where to play poker based on the criteria you select. The Poker Finder really does take all the stress out of selecting a room to play at, using a constantly updated database and our years of experience in the industry. We know all the operators to blacklist and those that are established and trusted. To get started see the Poker Finder on the right hand side of this page. Once you have used the Poker Finder to select a room to play at it will provide you with all the information for that room and clear buttons for you to click which will take you to the operators website to download the free software. Most online poker rooms require a short software download. There are a few poker rooms which offer web browser based software which means you don’t have to wait around while software downloads, but generally speaking, it is much more stable to download and install the full software which will also offer a lot more features and be much more secure. Most operators offer software for both windows and Apple Mac, and some will also offer versions of their software for mobile gaming such as on the iPhone / iPad and Android devices. Click the button or link to download the software and follow the on screen instructions to install the software on your computer. The next thing to do is to open the software and look for the button or link to register or open a new account. This is normally a quick process that will only take a couple of minutes with a simple form to fill out and submit. You will probably need to enter your email address and choose a password to ensure only you can access your account. Make sure you enter a valid email address as most rooms will send you an email with a link in it to validate your email address will send important confirmations for transactions like deposits and withdrawals to your registered email address. You will also need to choose a user name which will be your nickname (or handle) that other players will see when you sit at the table. You can have some fun choosing this as you are creating your online persona. It should not contain any personal information to maintain your privacy. You can use a nickname that you are usually called, or come up with something completely new and outrageous! Some sites will also let you upload an avatar or picture to go along with your new user name to complete your new online persona. Now you have your account setup, and you have verified your email address, you will need to make a deposit so you have some money available to play with. Look for the “Cashier” button in the software. You can choose the amount you want to deposit, most sites have very low minimum deposits that are not restrictive. Deposit options will vary by poker room but the usual methods are Visa, MasterCard, Moneybookers, Neteller and various other eWallet options. Neteller and Moneybookers work just like PayPal. You register a bank account, fund your new account from your bank, and then use the account for deposits at the poker room. We recommend that for your first deposit, if you can afford to do so, that you deposit at least $50 (US Dollars is the most common currency used at online poker sites) or the equivalent in your currency. The reason for this is that all of the major online poker rooms will offer you a bonus on your first deposit, which is free money and the more you deposit the bigger the bonus will be. So you want to ensure you take advantage of the first deposit bonuses that are on offer, with most rooms matching 100% or more of your first deposit. So, if your make a deposit for $50, you’d get $50 basically for free. Some bonuses are given immediately and others are released into your bankroll as you play and clear a certain number of player points which are just gained by playing in any of the real money games. At the end of the day you are only transferring money into your poker bankroll, you are not spending it yet, so you can always withdraw it again at a later stage and there are usually no charges to deposit or withdraw. Your now ready to play. Take some time to get a feel for the site and how to navigate around the software. There will be a lobby screen which is a list of all the tables and games available to play in and you will usually be able to select between the different formats of games, such as Cash Games and Tournaments and the different variants of Poker, such as Texas Holdem, Omaha, 7 Card Stud etc. You may be able to set filters on the lobby to only display the stakes or types of games that you are interested in to help you narrow down the search. Select the correct lobby, and set the filters for the type of game and stakes you want to play. Look down the list and select a table which has a spare seat. If there are no spare seats then you will be given the option of joining a waiting list for a table which will allocate you a seat as soon as one becomes available. Double click your selected table and it should appear in a window in front of you. Click on the empty seat to sit down at the table. It will ask you how much of your bankroll you wish to sit down with. You can select any amount between the minimum and maximum for that table, but the usual amount to sit down with is 100 times the big blind. So if you have selected a $0.02 / $0.05 stakes table then it would be normal to sit down with $5. You will have the choice of waiting for the dealer button to pass the seat you are sitting in before you start to play or if you don’t want to wait you can play in the next hand by posting a big blind (as you are out of sequence with the rest of the players). Once you have been dealt in to your first hand the software will provide you with simple buttons to allow you to select what action you want to take, fold, call, raise etc. Most poker software is fairly intuitive and you should have no problems getting to grips with it. If you want to take a break then just click the “Sit Out” button which will reserve your seat at the table but not deal you into any hands until you return. When you want to leave the table then there will be a “Leave Table” or “Stand Up” button which will return the chips you have at the table to your poker bankroll and vacate your seat allowing someone else to sit down at it. That’s about it – there really isn’t anything to be scared of. As long as you follow the simple steps outline above then you will have a enjoyable and safe online poker adventure. Remember, we are always here to help you, so if you run into any problems or are confused by anything then head back to us and we’ve probably covered it somewhere on the site. Or if you are still stuck then contact us and we’ll be only too happy to try and help you out.